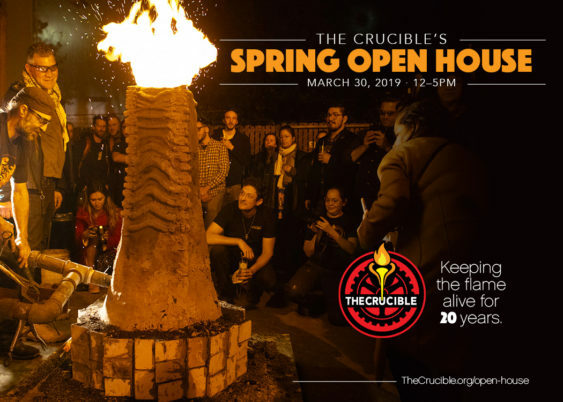 Join in for The Crucible’s most hands-on Spring Open House yet. There will be free hands-on activities (or for a small fee) in indigo dyeing, copper stamping, glass fusing, henna, leather working, stone working, and ceramics, plus inspiring and educational exhibitions in neon, glass blowing, blacksmithing, welding, and so many others. Learn more about the different disciplines you can explore at The Crucible by watching Crucible experts demonstrate their craft in 19 departments, including glass blowing, blacksmithing, foundry, ceramics, and more. With two live fire demonstrations, a curated art gallery from the community, and delicious food and drinks, you will want to bring your friends and family to this one. Make sure to come ready to register for classes, as every single Crucible class is $25 off. This event is free and open to the general public. All are welcome. However, parents of small children will need to pay special attention, as the studio space does have some rough edges.